University life this academic year is different, to say the least, for NIU graduate students Jeanna Ballard and Bryce Johnson. For one, their classes are smaller—nine students tops. Instead of peers hailing from Chicago, its suburbs and downstate Illinois, they come from hometowns in Germany, Pakistan, Malaysia, Mongolia and China. 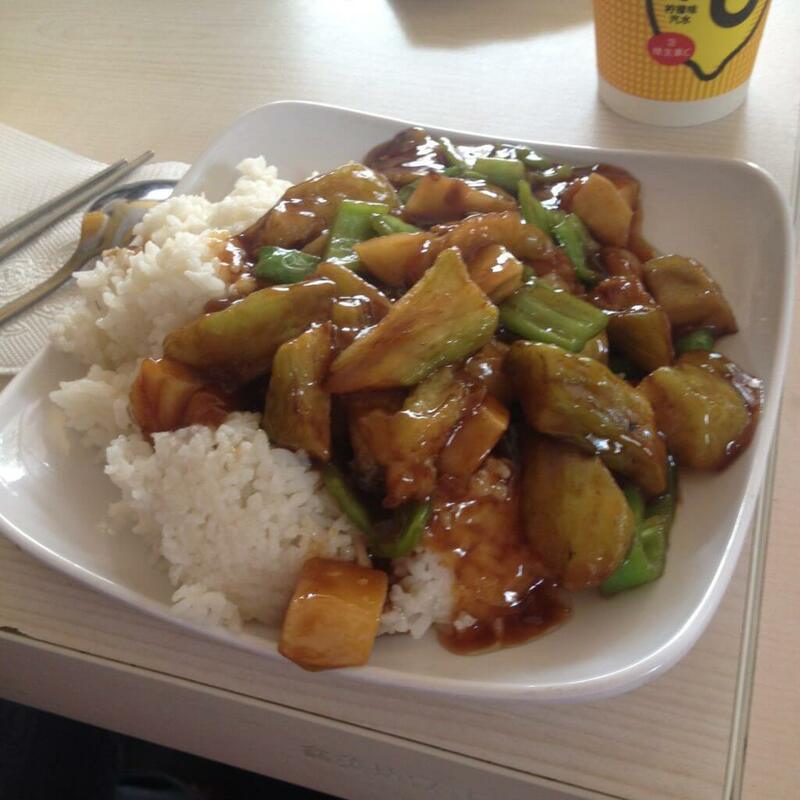 Jeanna Ballard says this dish of eggplant with rice, potatoes and green peppers is one of her local favorites. It set her back the equivalent of about $1.50 in U.S. dollars. Then there’s the food. Sure, McDonald’s and Kentucky Fried Chicken are nearby. But the NIU students are more likely to dig into a bowl of rice, dumplings or spicy noodles—or maybe even try one of those donkey burgers selling like hotcakes on campus. The meals are cheap, too, typically under $3. On weekends, Ballard and Johnson have countless options. They can enjoy nightlife in a city of 21 million people, trek into the mountains or visit historic sites, some dating back more than a millennium. You’ve probably guessed that Johnson and Ballard aren’t studying on campus in DeKalb. Instead, the NIU students are living in an international dormitory at Renmin University of China in Beijing, pioneering a new double-degree option in the Master of Public Administration (MPA) Program. 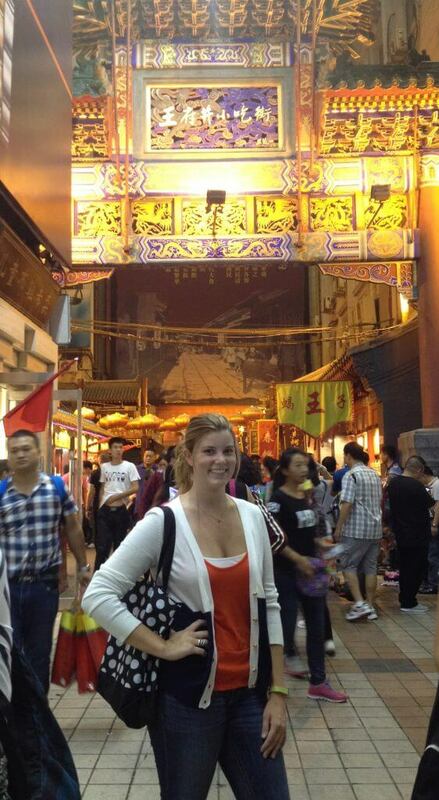 Jeanna Ballard at the Night Market in Beijing. 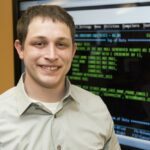 “It’s exciting, while at the same time overwhelming, to be the first to pave the path for NIU students to study at Renmin,” says Ballard, a 23-year-old native of small-town Gilberts, Ill.
NIU’s MPA program is perennially top rated, with U.S. News and World Report ranking it fifth nationally for city management and urban policy and 12th for public finance and budgeting. The program also has been a stalwart of Illinois good government, counting about one-third of all Illinois city managers among its alumni. 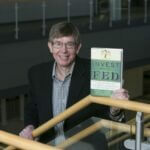 But now Illinois’ gold standard of local government expertise is going decidedly international. And the double-degree arrangement between NIU and Renmin is a shining example of this global direction. Not only are NIU students studying in Beijing, but their Chinese counterparts will soon be in classrooms in DeKalb, with a handful of Renmin MPA students expected to arrive on campus next fall. At the end of the three-year program, NIU students will earn an international MPA degree from Renmin, a top-ranked Chinese university, and an MPA with a specialization in Comparative Public Service from NIU. Renmin students also will earn degrees from both universities. Both Johnson and Ballard are picking up some of the Mandarin language, but their classes are taught in English. And they are gaining not just one new global perspective but many. Ballard’s network of new friends includes students from Slovakia, Finland, Malaysia, Zimbabwe, France, Algeria, Russia, China, Germany, Hong Kong, the UK, Lebanon, the Netherlands and the Democratic of the Congo. “This exchange program provides the opportunity to adapt a new mindset toward analyzing and solving problems by being exposed to new cultures, ideas and beliefs,” Ballard says. Kurt Thurmaier, founding director of the School of Public and Global Affairs (SPGA) and Public Administration chair, says the exchange with Renmin is just one aspect of his department’s global direction and an example of the types of opportunities fostered by the SPGA. “Our strategic goal is to have a double-degree exchange program on each continent, not including Antarctica,” he says. Bryce (left) and Jeanna (center) hiking with friends in the Jiankou section of the Great Wall. His department has already established similar double-degree arrangements with a second Chinese institution, Sun Yat-sen University in Guangzhou, as well as with the College of Local Administration at Khon Kaen University in Thailand, and is working to establish agreements with universities in Kenya, Mexico and Australia. In NIU’s more typical two-year public administration program, the curriculum is being globalized as well. It’s not so much a departure from the program’s bread-and-butter focus on local government management as it is a recognition of the long reach of globalization. Graduates of the NIU MPA program typically move on to posts ranging from community planners and city administrators to managers with non-governmental organizations and state and federal agencies. As an example, Thurmaier points to managers within the U.S. Environmental Protection Agency, who are working with their international counterparts on laws and regulations surrounding climate change, water treatment and air quality. 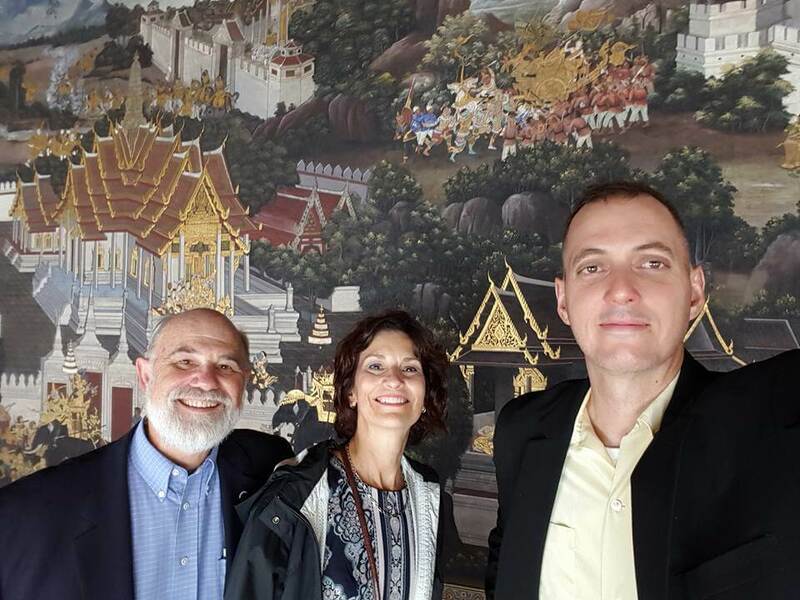 Kurt Thurmaier (left), Denise Burchard and Aaron Deslatte at the Grand Palace in Bangkok. 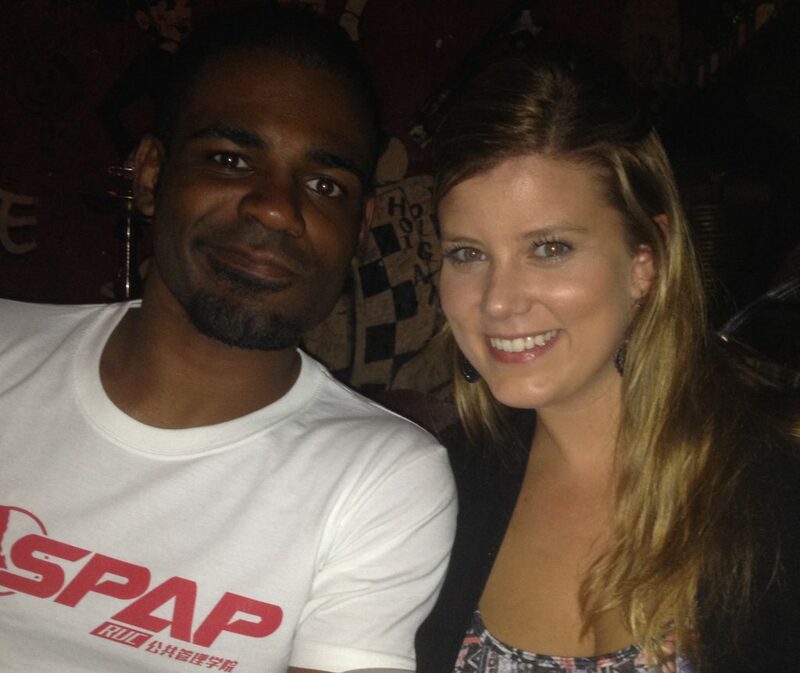 Going global requires recruitment of students from around the world. Toward that end, Thurmaier, MPA student adviser Denise Burchard and Professor Aaron Deslatte recently traveled to China and Thailand to cement academic ties and meet with potential students. The MPA program already boasts students from the countries of Russia, Moldova and Namibia here on Fulbright Foreign Student grants. 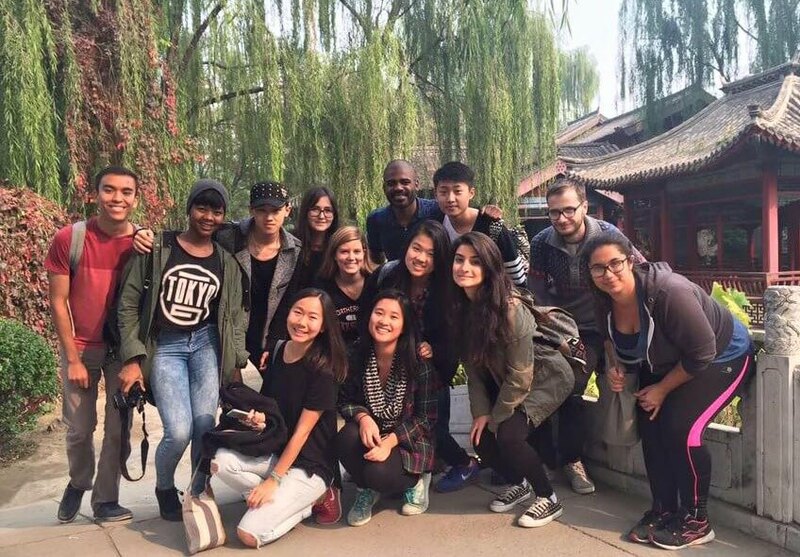 Meanwhile, NIU students Ballard and Johnson will help recruit Renmin University peers interested in studying at NIU. They also will identify challenges and any program wrinkles, to smooth the landing for the next exchange students from NIU. During their first month, for example, it took some getting used to the culture shock, as well as the bureaucracy involved in simple tasks such as getting a student ID card. “You have to learn quickly how to adapt to the new culture and how to rely on and trust yourself,” Ballard says. 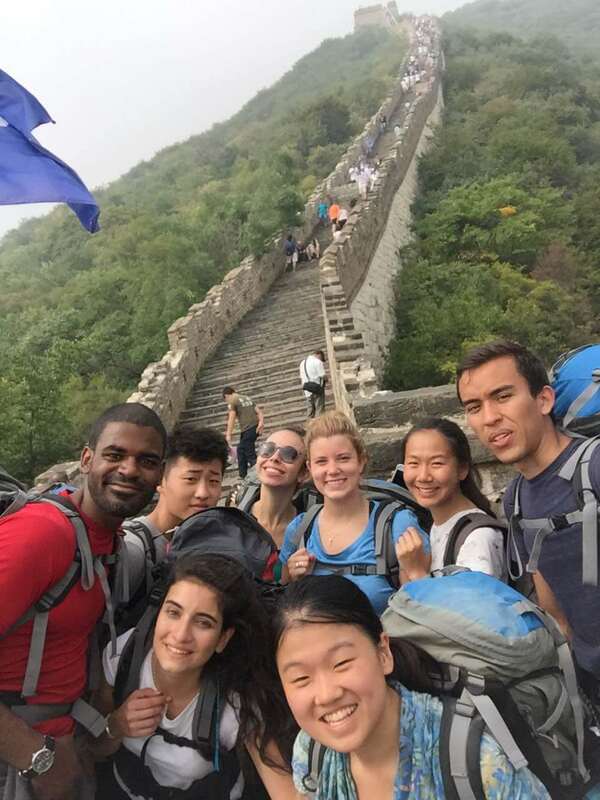 Despite a few bumps in the road, both she and Johnson are thrilled with their learning and cultural experiences, which have included an overnight hike with other students to the Great Wall of China.